Welcome to a new newbie-focused series that aims to get players up to speed on the options that they need to know exist in order to be efficient and successful in Eve’s universe. These options, which are not related to the possibilities provided by the in-game client, often come as in the shape of third party tools and they range from accessibility matters to outright advantages. And all of them, completely EULA-legal and unbannable for. So join us as we peel back the layers so you can see how outmatched you were, when you thought you had the upper hand. These are the tools of the trade of Eve Online’s hardened players. The subject of this article is the wonderfully powerful Pirate’s Little Helper, a tool made by Rischwa Amatin. At its very basic core, it’s a tool to quickly get information on who’s in local with you, as well as some measure of awareness of surrounding systems. While it does have a functionality to track your character via CREST, accessible via the options menu, the basic way in which it interfaces with your game is via scraping your computer’s ‘clipboard’, what is in it when you push ‘copy’ on any bit of text. And since a lot of Eve’s interface is copy-pasteable in parsable text form, local for example, it wasn’t long until something like this came out. We’re going to be talking quite a bit about this. It also features a way of pinpointing someone down in a system and of creating POS-maps, basically the composition of POSes and their location. First and foremost, it can provide a super-quick overview of anyone in local. 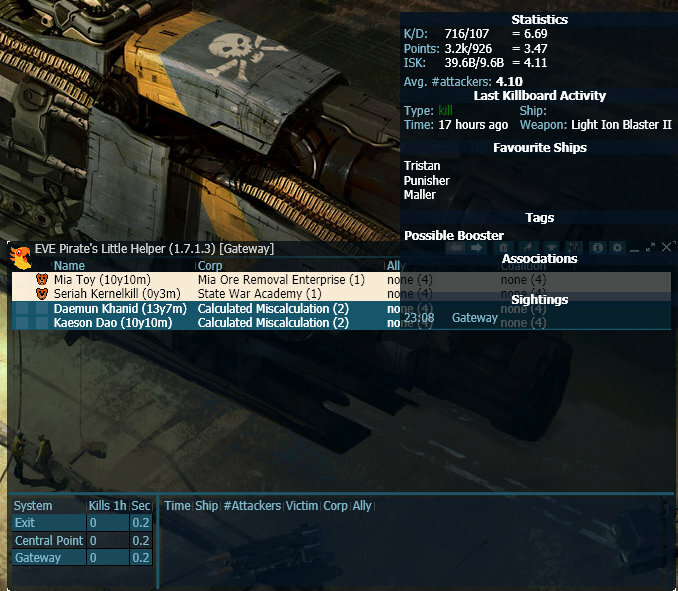 Hovering over names gives you some stats like K/D ratio or ISK efficiency, but also some vague notion of the ships they flew in the last period, and more importantly, what have they been doing lately. It also appends where that player was last seen, as in, where you last copy-pasted his name before in that session. 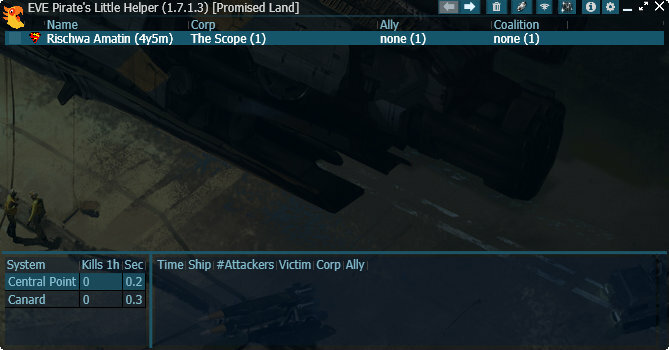 Finally, it also groups players by corp/alliance if you wish, so you have an instant overview of who’s in that system with you. It gives instant and perfect information, further checkable by double-clicking names that opens up a zKill/Evekill page of that character. These things can help you see if there’s a battle or a camp on a gate. It can help you see if that particular target you’re hunting is truly solo or not, at least for the first minute. It can help by quickly showing previous fits if you already know what ship someone is in, as well as avoiding any ganks. It also uses vague, may-not-be-correct, tags, like ‘Cynobait’, ‘Carebear’ and such, scraped from various killboards, which, while it may not paint the full picture, usually paints a brush-stroke in the right direction. In short, it’s an information tool on steroids and while less useful for large fleets or engagements, it’s critical for solo or small gang work, or even getting around New Eden. Using the same copy-paste mechanics, it can also function as a POS mapper and a D-scan locator. That is done by selecting ‘All’ on the D-scan preset and setting distances to km, not AU. Ideally you at least nail down within proximity range what you want to find, if not the exact planet, and then copy the results. 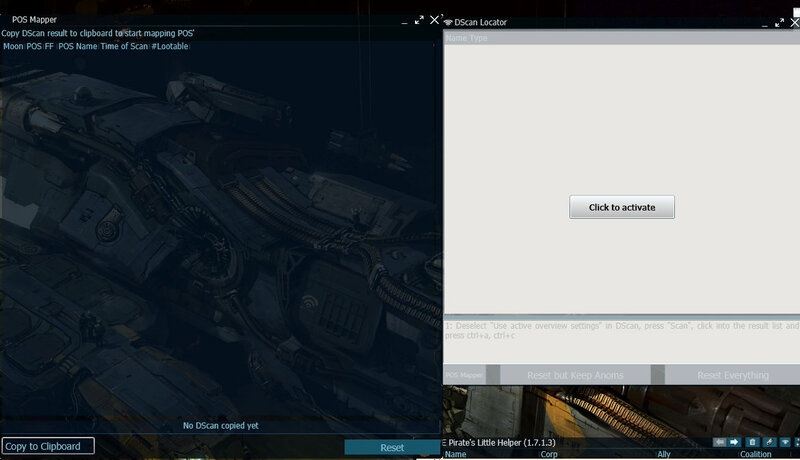 Click the corresponding window and select your target, and then you get a new distance inputted into your clipboard. Paste that into the D-scan distance box and search. Select the new results, copy, and then paste the injected new distance and search again. Repeat until it has narrowed down what you’re looking for in the main window. While the use is dubious for D-scanning since it’s quirky and may be slower than regular D-scanning, it can be useful in very crowded systems. 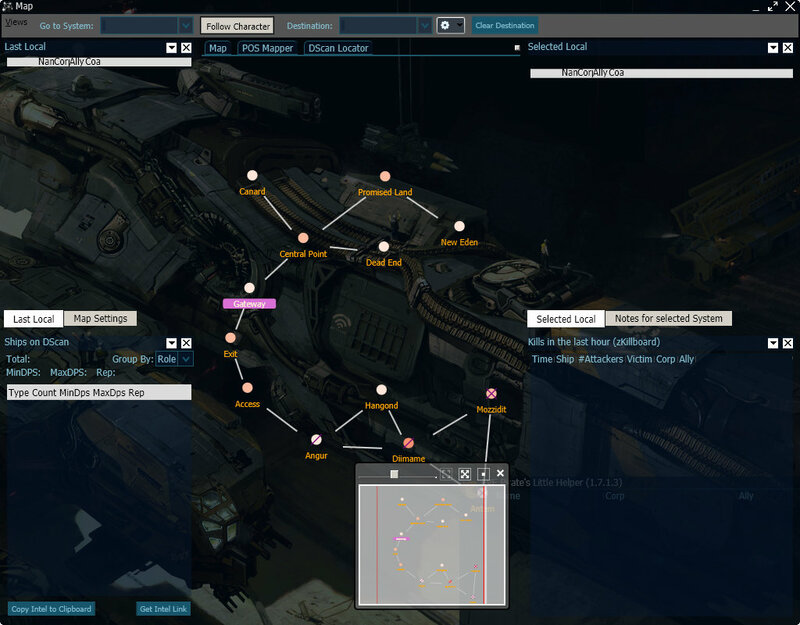 The POS mapper can be of better use, as you can quickly see forcefields and compositions; it will even mark if POSes have anything ‘Lootable’ like a Ship Maintenance Array. This has an advantage over manual use because it can be done almost absent-mindedly for entire systems. What would you have to do without this tool? 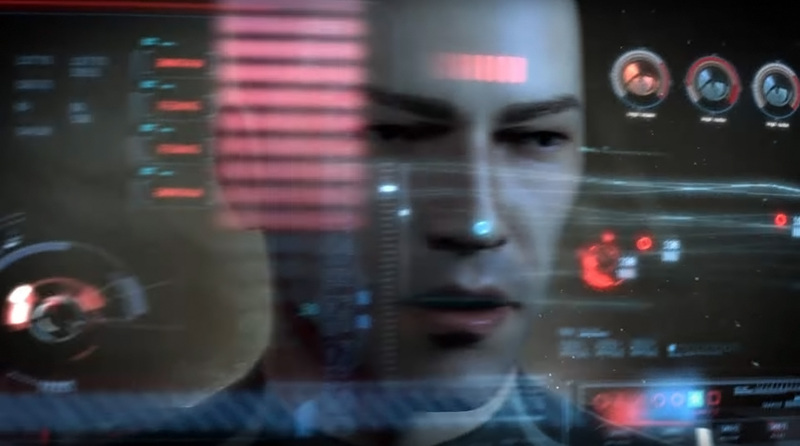 Well, for the local-awareness, you’d have to manually double click everyone in the system, then mentally remember who and how many, and not like you could easily check alliances from that point. In short, you couldn’t in-game do what this tool does. While you could use third party local checkers like adashboard.info/intel to simulate what it already does, they’re far from having the same usability or focused features that PLH offers. Coupled with linked ‘kills in the last hour’ of surrounding systems and pod-checker features, not to mention a history of previous local copies, PLH stands above all other options as the premiere local-awareness tool. As for the D-scan tools, one can say it teaches poor skill, and you could do a lot more with just the tools provided by the game and a lot of experience in hunting and D-scanning. While this much is true, it can’t be denied that sometimes, it’s just easier and even faster to use it. It still requires you to know something about how it works and when it’s best to use it, but it’s still an advantage. What else does it do? 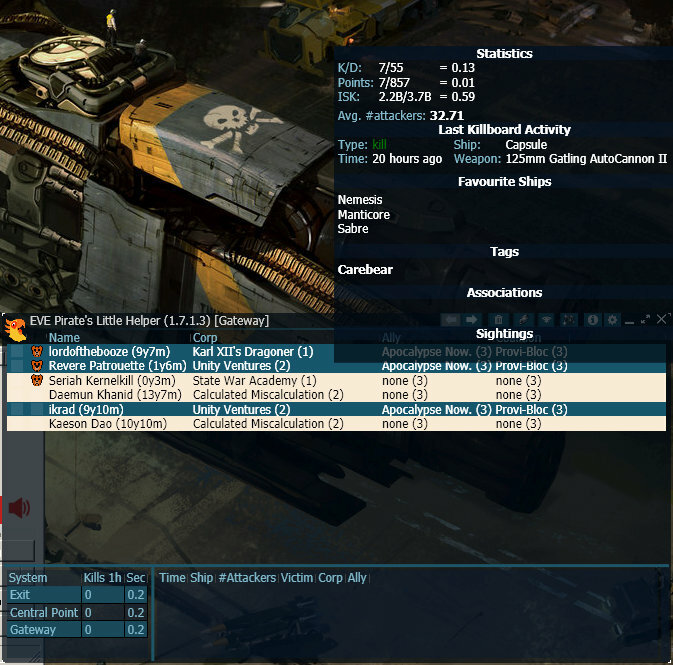 It also features a mapping tool that furthers the local checker with a DPS/REP counter of enemy ships, for what you’d mentally add up yourself, as well as quickly sharing intel links. More of FC/scouting features, but nothing that you couldn’t replace with just good old ball-parking and experience, probably even better. A bit more importantly for those FW-minded, it can also show the faction of the pilots in your system as well as options for profiles which can be set for each character if you have multiple characters with different gametypes. If you activate in K-space, PLH is the best awareness/information tool you can use. It provides vital and otherwise inaccessible information within an instant timeframe. It does almost nothing for wormholes, but even then, when you dip in K-space, you may want that quick info dump before you jump back through the wormhole to decide what to do about the locals. Did you enjoy this article? Please consider supporting Crossing Zebras. Cosmo has been playing Eve Online for the better part of a decade, on and off as most Eve 'careers' go, over the span of a dozen trials and over multiple accounts. He's your average every-man player, with no hats thrown in any rings and with enough perspective to not get bogged down in endless threadnaughts on how every new feature will 'ruin' the game. He loves the concept of Eve and the potential of what it could be more than the actual grimy bits that currently define the experience. "An Eve Online beyond Eve Online" as he likes to put it.